The amount of support your body has will change the amount of control your body needs to exert to maintain its position. Poor motor control can be the cause of injuries. This poor movement pattern is not optimal for maintaining healthy joints and balanced muscles, so over time, these muscles wear down. At Motion Stability we do a thorough assessment to determine what patterns of movement might be contributing to your injury, pain, or less than optimal performance. We then teach you how to correct these patterns so you can optimize your function and performance and decrease your pain. Dry needling is an invasive procedure in which a solid filament needle is inserted into the skin and muscle directly at a myofascial trigger point. Physical therapists utilize dry needling in the treatment of myofascial pain. Oftentimes the patient is rehabilitated from their injury or pain state and then discharged. However, the patient has not been conditioned to return to their occupation or back to playing competitively or recreationally. Many times, the work or sport movements are what originally caused the problem in the first place. At Motion Stability we focus on returning the patient so that they are performing optimally for their sport or work to prevent re-injury. Manual therapy are hands on techniques used by our physical therapists to assess and treat movement dysfunction in the body. It includes a detailed assessment of the muscles, joints, fascia and nerves as well manually applied movement techniques such as joint mobilization, myofascial release, soft tissue mobilization and nerve mobilization to treat excessive and restricted movement. The therapists at Motion Stability have all taken post-graduate courses in orthopedic manual therapy. Therapists at Motion Stability are specially trained in using nerve mobilization called ‘neurodynamics’ as a treatment approach to address nerve related pain and injuries. Neurodynamics is the integration of the mechanics and physiology of the nervous system in the manual treatment of neuromusculoskeletal disorders. At Motion Stability, we use rehabilitative ultrasound imaging to visualize muscle control, especially muscles that are difficult to see from the superficial skin. Such muscles in core stability such as the transversus abdominis, multifidus, and pelvic floor are key in providing proper core stability. Ultrasound imaging provides feedback to the patient whether the proper muscle contraction is being performed. Redcord, also known as Neurac, is a system that originated in Norway. Redcord is designed to help patients with musculoskeletal pain regain normal function by using high levels of neuromuscular stimulation. This is accomplished by suspending the patient in a series of slings and bungees that offload weight and allow the therapist to perform manual therapy techniques and gradually increase weight-bearing exercises while reducing or eliminating pain. Given the right clinical presentation, the use of modalities such as electrical stimulation, ultrasound and other interventions are appropriate to calm pain, muscle guarding, and promote healing. Our physical therapists utilize modalities in the appropriate time of your pain presentation. Motion Stability is trained in various taping techniques to help facilitate, inhibit, or support musculoskeletal conditions. The hip can be a common cause of musculoskeletal pain. The hip can also be affected by the pelvis, low back, as well as the lower extremity. Pain generated from the pelvis and low back can refer into the hip and groin, which makes treatment difficult. Due to the complex nature of this area, patients with hip pain often struggle obtaining a proper diagnosis and treatment for their particular dysfunction. treatment strategies for the patient’s condition. Along with the physician’s assessment, the Motion Stability Physical Therapists will help to determine the myofascial and skeletal imbalances that are contributing to the patient’s condition. Whether it is conservative physical therapy management or post-surgical care, the physical therapists have the expertise to work efficiently with the patient and their physician towards the best outcomes for the patient. Once the condition has been evaluated thoroughly including the hip structure, sensitive tissues, muscular imbalances as well any influences from the spine, pelvis, and lower extremity the therapist will construct a treatment plan guided by their findings. Many hip pathologies result from lack of strength and motor control of the hip stabilizers; glutes, iliopsoas, obturators and gemelli, to name a few. Therefore, treatment is a two-pronged approach that often focuses on manual therapy techniques to restore optimal mechanics of the hip, surrounding structures, and tissues and guided exercises to improve strength and coordination of the muscles used to stabilize the hip correctly within its socket. 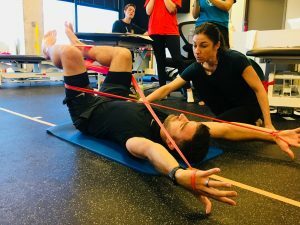 Once optimal mechanics of the hip are restored, the therapist will work with the patient to return him/her to their desired level of function and athletic endeavors. This may include collaboration with the patient’s parents, coaches, and trainers. Labral Tears– The labrum is a ring of cartilage surrounding the hip socket to deep it and provide more stability for the joint. The labrum can be torn or irritated due to trauma or abnormal mechanics causing rubbing of the head of the femur on the rim of the joint. If the labrum is being treated conservatively (without surgery) treatment focuses on improving the mechanics of the joint to decrease any further degradation. Impingement– (Femoroacetabular Impingement (FAI)) occurs when the ball and socket do not fit congruously together and the ball (femoral head) does not have adequate range of motion and rubs abnormally on the socket. Patients may be asymptomatic at first, but if left untreated the condition can progress to cartilage and/or labral damage. Post-Surgical– The most common athletic hip surgeries are a result of cartilage and labral damage. These conditions can occur in combination or independently of each other. The Motion Stability Therapists have extensive experience working with some of the top hip surgeons nationwide in rehabilitating patients who have undergone these procedures. Treatment is guided by the referring physician’s protocol and the presentation of the patient and is aimed at returning the patient to their desired level of function and return to sport. Iliotibial Band (IT Band) Syndrome– The IT Band runs along the lateral thigh and can cause pain from its origination at the lateral pelvis all the way to its insertion at the lateral knee. Overuse of the IT Band can be affected by weakened lateral hip musculature, poor lower extremity mechanics, or a more commonly a combination of both. Tendinopathies– Tendons are the connections between a muscle and bone. The term tendinopathy can include both tendonitis (inflammation of the tendon) and tenosynovitis (degeneration of the tendon sheath and usually a progression of unresolved tendinitis.) Tendinopathies of the hip primarily occur in the hamstrings and glute tendons and are usually an overuse injury as a result of muscular imbalances and incorrect mechanics. Tendinopathies are usually very painful to stretch and use of the affected tendon. Piriformis Syndrome– The piriformis muscle extends along the back and lateral side of the hip and can cause deep achy pain in sitting as well as walking or running. When this muscle is overused due to weak lateral hip musculature it can also compress the sciatic nerve and cause neural symptoms down into the lower leg. Snapping Hip– Has 2 main causes: the IT band snapping over the head of the femur or the iliopsoas not able to stabilize the joint causing a click as the joint is moved through its range of motion. Athletic Pubalgia– More commonly known as a sports hernia. This condition is characterized by a generalized groin pain that can spread to the inner thigh. The pain is usually aggravated by twisting, turning, or extending the hip. The hernia can occur in a number of lower abdominal insertions or fascial connections and can sometimes involve the ilioinguinal or genitofemoral nerve. This condition can be treated surgically or conservatively. Whether it be a herniated disc, spinal degeneration, or fascial tightness in structures like the carpal tunnel, it is important to treat any physical structure that can compress or ‘pinch’ the nerve. Interventions such as traction, manual therapy, or medical interventions that can range from injections to surgery can reduce the pressure on the nerve and relieve its symptoms. Even if the mechanical compression is relieved, patients may still have nerve symptoms. The residual symptoms are due to the nerve itself being left untreated. Nerves should be elastic enough – like a bungee cord – to lengthen in order to match your daily motion. However, with inflammation, the nerve becomes less elastic and more irritable with movements that extend it beyond its available motion. It is vitally important to improve the mechanics and physiology of the nerve, so that it is able to perform its intended function. In physical therapy, we utilize nerve mobilizations to improve the mechanics and physiology of the nerve. Lastly, tissue that an inflamed nerve innervates can maintain nerve symptoms. This innervated tissue can manifest itself as fascial restrictions, muscle trigger points, and joint restrictions. It is important to improve the integrity of these structures as they are manifestations of the nerve’s system not working correctly and can perpetuate the dysfunction. Treatments can include, but are not limited to, manual therapy, appropriate exercises, and intramuscular manual therapy.